Have you ever thought about how empty shipping containers make their way back to the original sender? Numerous companies and startups are looking to solve the empty container problem, which costs the logistics industry around $20 million per year. In fact, around one in four containers are empty during transportation. But using collapsible storage solutions can help fight this problem. When your products reach their destination, the shipping company can collapse the container, so it will take up less space in their vehicle or maritime vessel. Here’s more about shipping with metal wire baskets and why it might be the best choice for your business. 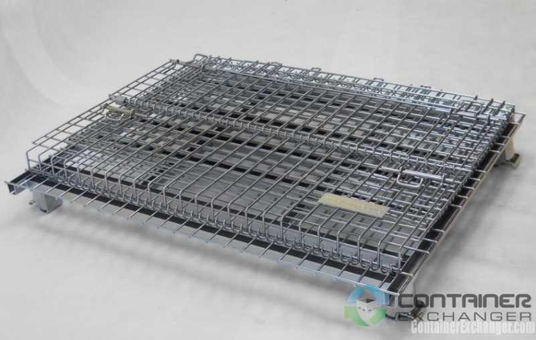 It’s best to use metal wire baskets when shipping large items that can’t slip through the holes of the container, such as large pieces of equipment, consumer goods and other bulky self-contained items. Some baskets come with wheels, which makes it easy to move your products around without lifting them. The biggest benefit to shipping with collapsible containers is that you can collapse them when you’re finished using them. This can be crucial if your carrier service charges you per square inch or if your company needs to make room for additional items. When you’re not shipping your baskets overseas, you can always collapse them in your warehouse to save on space. If you hire a logistics company to move your products for you, you can lower the cost by having them return a collapsible container instead of a new one. If you don’t plan on having the company return your shipping materials, remember it’s better to invest in reusable shipping materials. It saves money and benefits the environment. Talk to your carrier service and ask about lowering the cost of shipping with collapsible baskets. Your shipping materials may spend some time outside in poor weather or they may get wet when loading and unloading items near the ocean. That’s why it’s important to find corrosion-resistant shipping materials so your materials won’t degrade over time. Newer metal baskets are made with composite materials that won’t rust, even if they’re exposed to rain, snow and crashing waves. Read about the materials used to make your baskets before purchasing them and consider the conditions in which your baskets will be traveling. Most baskets can be folded in just a few minutes or less. It may take two people to fold up the basket depending on the size and weight. If you’re anxious to save space, you don’t have to worry about stopping and waiting for your crew to fold up the baskets before moving on with your route. Make sure you always put the heaviest items on the bottom. If you put heavier items on top, they could damage the container underneath. Try to distribute the weight evenly in your baskets so they don’t suddenly shift to one side. You should also secure your wire baskets when transporting them overseas. Turbulence on the ocean could lead to your baskets sliding around, which could damage the contents of the basket or injure someone nearby. If you have loose cargo in one of your baskets, consider tying your items down to the floor of the basket, so they don’t shift during transit. If you’re shipping folded collapsible containers, secure them together so they’re easier to move. Otherwise, they could easily slip out and move around during transit. Avoid stacking your baskets too high during transit or they may fall down and injure someone, especially if there’s a lot of turbulence during the trip. When shipping with stackable wire baskets, secure your containers together to avoid containers falling over. Avoid leaving empty space around your collapsible containers. Insert bricks, air bags, nets and other shipping supplies to prevent the containers from moving around. Avoid overloading your containers and always adhere to the weight guidelines. 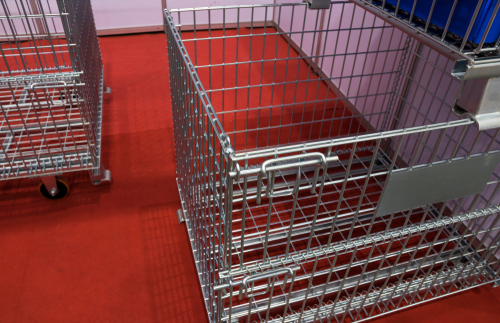 Wire metal baskets can help you save money and precious cargo space when shipping. Whether you’re moving your cargo overseas or by truck, these containers are reliable and completely reusable. 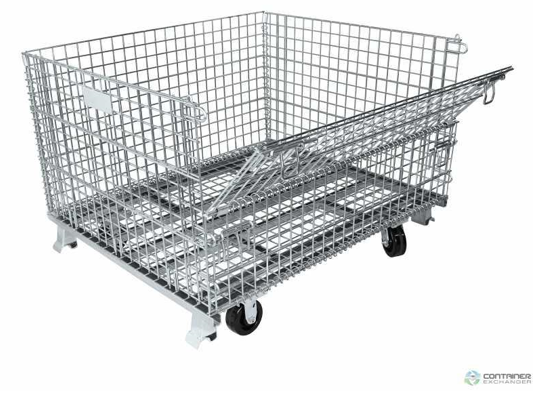 Many baskets even come with wheels, which makes it much easier to move your cargo around. You won’t have to worry about messing with forklifts or moving your products by hand. Stop shipping empty containers back and forth and switch to metal folding baskets today.